Welcome to our review of the Worcester Greenstar RI regular boiler range. Confused about whether the Greenstar RI is for you? Want to know where to get the cheapest installation price? Do You Need A Regular Boiler? First up, do you need a regular boiler like the Ri from Worcester? If you have a hot water cylinder and a cold feed in the loft, you have a regular boiler. You don’t HAVE to keep it. Most boiler installers will be able to upgrade your regular boiler, to a combi. All 7 boilers are the same size: 600 x 390 x 270. And, that’s REALLY small; it’s going to fit in an average sized kitchen cupboard, so you won’t have to hang it on the wall. Size wise, as a quick example, the Worcester CDI Compact is also designed to fit into small spaces. Its dimensions? 690 x 390 x 280, so a full 80mm taller and 10mm deeper than the smaller Ri. The core differences between the Worcester Ri range don’t just lie in the central heating output, but the flow rate too. As an example, you’ll get 4.9l @ 35°c on the 9Ri, but up to 12.2 @ 35°c on the 30Ri. Which Size Greenstar Ri Boiler Do You Need? We could estimate this, and guess that, but there’s an easy way to work out which size Ri boiler you need. Essentially, the bigger your property, pipework run and the more radiators/showers you have, the bigger the boiler needs to be! Jump over to BOXT which has this free boiler size calculator. Note: You’ll need to click “standard” for boiler type. After filling out a few details about your property (via a simple, clickable multiple choice form), you’ll see the boiler they recommend, as well as some alternatives. Like all A-rated boilers, the Greenstar RI range is incredibly efficient. Taking the 24Ri as an example, you’ll get seasonal space heating efficiency of 92%. Alongside that, you’ll get 86.7% efficiency when it’s working at full-tilt (24kw), but that increases massively to 97.2% when you drop it to 30% of capacity (8kw). So, That Means Savings On Energy Bills? The efficiency rating of your old and tired boiler. For example’s sake, the Energy Saving Trust estimate that an average mid-terraced house using a G-rated boiler, could save up to £175 per year on their gas bill, simply by fitting an A-rated appliance like the Worcester Ri. That’s JUST on energy bills, not to mention the constant maintenance and repairs old boilers need. Not bad, considering you find Worcester installers offering finance packages from around £12 per month. You could save enough on energy bills, to cover the monthly cost of your new boiler! So now we come to prices. How much should you expect to pay to have your Worcester Ri fitted? Like sizing up a boiler, there’s no one size fits all when it comes to installation costs. Do you need new TRVs? Will you want the boiler moved to a new location? Would you prefer to convert to a Worcester combi boiler, rather than the heat-only Ri? To take the guesswork out of this process, we’d suggest using the same calculator we mentioned above. 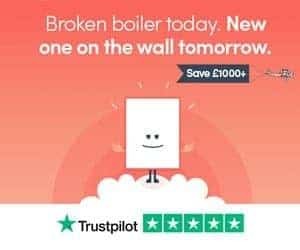 Not only is this going to list the most suitable boiler for your property (at the top of the list), it’s going to give you a price on screen, in around 90 seconds (no personal details needed). Free filter (RRP £130) to protect your new boiler! You can use the form to determine which size boiler you need or prices for Worcester RI boilers here. Worcester have their own way of protecting your boiler during winter; the Condensesure Siphon. The aim of the Condensesure Siphon is to stop your boiler locking out in temperatures below freezing. Typically, this happens due to the condensed gases in your condensate freezing as they slowly drip out. That’s you without a boiler, and an expensive repair engineer on their way to give you a quick-fix; bad news! Instead of the above scenario taking place, the Condensesure Siphon builds-up these condensed gases, releasing them in batches, meaning there’s less chance of them freezing. In fact, Worcester assure buyers the boiler can sustain 48 hours at -15°C. For this to be possible, pipework needs to be routed as close to vertical as possible, and 32mm needs to be used, rather than the standard 21.5mm. We like boilers with a minimum of 5-years warranty. At the end of the day, if a manufacturer thought their boilers would last longer than 2, 5 or 7 years, they’d offer a warranty to suit; the length of warranty says a lot about the product your buying. The Worcester Ri boiler range gets a huge 10-year warranty, when installed by BOXT. Should You Buy A Worcester Ri boiler? When using local installers, there are alternatives at roughly the same prices from the likes of Baxi, Vaillant and Ideal. However, when you account for the fact that BOXT are getting Worcester boilers so cheap direct, the overall installation prices comes in much cheaper than it would from a local installer, and in most cases, cheaper than the Baxi or Vaillant equivalent. You can check prices in less than 90-seconds using their clickable form. Thanks for reading our review of the Worcester Greenstar Ri range. Want to compare installer’s prices back to back? Read our full guide on boiler installation. Still got questions about whether this is the right boiler for you? Drop us an email via our contact form, and we’ll do our best to help you out.